Calling all Golden Knights, Environmental Do-Gooders and Former Polluters looking to atone for past sins: there’s a spectacular opportunity to do something great for Michigan’s environment at a not-too-spectacular price. The Liberty General Store, south of Jackson in Liberty Township, is for sale. It’s a nice enough store: couple of gas pumps with shelves offering booze, beer and beef jerky. The manager’s been helpful to us and he keeps the place looking good. The asking price is $365K (according to the Realtor and despite the higher price in the listing), which is about the price of an average home in the subdivision next to my condo complex in Ann Arbor. But what makes this opportunity special is that the sale includes frontage on the millpond behind the store and, most importantly, ownership and control of the dam that grudgingly releases water from the millpond. That released water, after tumbling down the face of a concrete wall, becomes the Grand River. The millpond and the dam are often referred to as the headwaters of the Grand. The dam has been there for more than a hundred years, but it no longer serves any purpose. There’s no mill, hence no need for a millpond. The dam once generated electricity, but hasn’t done so for a number of years. Furthermore, the dam is privately owned. What happens when it needs expensive maintenance? What if the owner said, “Nah, I don’t have that kind of money. Let it crumble; it’s not doing me any good”? Who will be held accountable if the dam suddenly and catastrophically fails? I doubt that a closely-held corporation with minimal assets, an entity formed to operate a party store, would be able to make good on the ensuing damage. The water of the millpond,before flowing over the dam. Water flowing over the Liberty Millpond Dam. Our dream, then, my brother’s and mine, is that some environmental savior would buy the property and begin the process of working with state and local government – and affected property owners – to remove the damn dam. Hey, maybe the State of Michigan should buy the property. Even in these days of budget and tax cuts, the state has a proper and vital interest in owning and controlling the starting point of our longest river . . . especially when that can be accomplished at this price. There is a movement toward removing dams along the river in an effort to restore the river to something that more closely resembles its natural state. The results of dam removal have included increased recreational opportunities and improved fish habitat. Eaton Rapids, Dimondale and Lyons are among the municipalities which have removed dams that were deteriorating and no longer served any purpose. Grand Rapids continues to evaluate a major dam removal and habitat restoration project. I’m not a scientist nor an engineer, but certainly scientific and engineering factors need to be taken into consideration when contemplating major changes like this. Private property rights will be at stake and those concerns must be addressed as well, so whoever buys the property should have pockets deep enough to hold on through the decision-making process, which would likely stretch on for several years. So there you have it. What else could any person or organization do which would have such a significant impact on the health of the Grand River and, indeed, the environmental health of our entire state? This opportunity will not last forever. Someone may buy the party store next week, someone with nary a drop of interest in the Grand River. The property can be had for $365K, give or take a few grand. My brother and I wish we could buy it. We can’t, but we’d throw what we can afford into the kitty. Who will step up to the plate here? Do it for the river. Do it for the state. Do it for yourself. Postscript – My brother Tom deserves credit for coming up with this idea, at least between the two of us. I blew him off at first but now I’m as passionate as he has been from the start. We have written about dams previously; see the entry dated December 11, 2016 and entitled “Remove the Dams?”. One final thought. If you agree with this post, would you please share it (on Facebook and other social media, by sending a link to friends, etc.)? The more people who read the post, the more likely we are to find some person or organization that could make this happen. 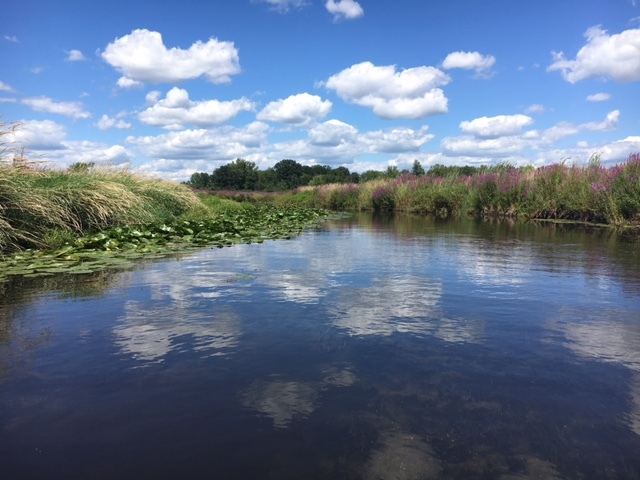 This entry was posted in Environment, Michigan, rivers, Uncategorized and tagged brothers, canoeing, dams, Dimondale MI, Eaton Rapids MI, Grand Lake, Grand River, Jackson County MI, Jackson MI, Liberty General Store, Lyons MI, Michigan, paddling. Bookmark the permalink.